The holidays hit hard and it looks like a toy-filled bomb has exploded in our home! I’m quite certain that every Disney Princess visited the girls playroom while we were sleeping and they all forgot their dresses! With the holidays now behind us, it’s time to focus on spring cleaning, and after the large amount of traffic we incurred over the holidays, the carpets are the first item up for business! Carpet is a funny thing isn’t it? A few spots don’t really seem like a big deal when your a mom. We see spots everyday…not only on the floor, but on the walls, the glass, the windows and if you live in my home, you’ll see spots of ketchup all over your pants at times. What’s surprising about carpet, however, is that those few spots actually contain an obscene amount of dirt and it wasn’t until we used the Hoover Platinum Collection carpet cleaner, that we really found out how utterly disgusting dirty the carpets really were. Keeping The Standard For Clean Set On HIGH, the Hoover Platinum Collection features six products designed to get floors truly clean – quickly and easily – so you can move on to other things in your life. The Hoover Platinum Collection Carpet Cleaner features Hoover MaxExtract Technology with a truly advanced combination of multi-action agitation, carpet washing, dirt removal and direct heat drying – all in one machine. Dual scrubbing, multi-directional brushes surround carpet fibers and remove dirt at every angle, then high velocity suction removes dirty water and detergent residue, followed by forced heat that further speeds the drying process, leaving carpet revitalized. The Hoover Platinum Collection Carpet Cleaner removes more dirt from carpet with less detergent than other leading brands of carpet cleaners. Its intelligent cleaning system effortlessly delivers a thoroughly cleaned floor in a room you can live in again within hours. The set up took a matter of minutes, entailing snapping the top end of the cleaner to the bottom and inserting two bolts. Once completed, I filled the water tank and the cleaning solution tank and went to work! Once the tanks are filled, the process of cleaning is really quite simple and the carpet cleaner does the majority of the work for you. The carpet cleaner features push button, computerized controls on the front of the unit, and light-up prompts let you know exactly where you are in the cleaning process. From the control panel, you can choose which surface you are planning on cleaning (Carpet or Rug) and this carpet cleaner is smarter than you would think, even letting you know when the dirty water tank is full! The process of cleaning includes a wash cycle, rinse cycle and two dry cycles. Each time you push the carpet cleaner forward or backwards, it automatically knows what it’s doing, leaving the thinking up to the machine. If carpets have spots or stains, the carpet cleaner has a narrow and wide spot cleaning option to ensure proper cleaning. The Hoover Platinum Collection carpet cleaner comes equipped with on board tools including a SpinScrub hand tool, cervice tool and carpet/upholstery tool. These on board tools allow you to clean stairs, upholstery or any other small areas using the attached hose. Oh how I wish I had these with my last couch! Our girls entry way in their bedroom is a high traffic area and this is what we started with (I know, ewwwwe)…. I have to admit that I am apprehensive of any carpet cleaner. I have tried a few over the years and although a little bit of dirt came out, it certainly wasn’t what you would call… impressive. We typically use professional carpet services (of which doesn’t remove some of the spots and stains) and just used one of these services 4 months ago, so I wasn’t expecting much when I put the Hoover Platinum Collection carpet cleaner to work! The professional carpet cleaners are now fired! The spots are gone and the proof is right inside the dirty water tank! The Hoover Platinum Collection Carpet Cleaner surpassed all of my expectations and then some. Although a bit big in size, it’s amazing on board computerized control panel, multiple SpinScrub’s, sleek design, and ability to clean stairs and upholstery, make this carpet cleaner worth it’s weight in gold! The Hoover Platinum Collection Carpet Cleaner retails for $399 and can be purchased online at Hoover or at Amazon . Additonally, you’ll need to purchase Hoover’s carpet and upholstery detergent, which will retails for around $20. 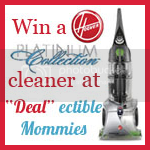 One Lucky “Deal”ectible Mommies reader will WIN a Hoover Platinum Collection Carpet Cleaner (RV $399)! How to Enter: This is a two step entry. You must complete both #1 and #2 to gain your main entry. Extra Entries: Please Note that the initial entry must be completed before any extra entries will count! Please leave a separate comment for each entry. 2. *2 Extra Entries* Grab the giveaway button and place it on your blog/website! The boring stuff: Giveaway is open to US residents only. Giveaway ends on February 20th at midnight! Winner will be chosen at random. Disclaimer: I was provided with a Hoover Platinum Collection Carpet Cleaner to facilitate my review. My thoughts and opinions remain my own! Win $500 for Your School! I follow Hoover on twitter as bobbysgirl703 and like you on facebook. I follow you by google friends connect as bobbysgirl703. I follow Hoover on Twitter and tweeted about the contest! Of course I follow you on Facebook! I follow Hoover on Twitter! I already do like Deal-ectable Mommies on fb! I liked Hoover on Twitter and like you on Facebook! I’m following Deal-ectable Mommies on Twitter and I tweeted about the contest. I’m following you with Google Friend Connect! I like you on facebook and follow hoover on twitter. I subscribe to your wonderful emails thanks! I follow Hoover on twitter (bec289) and like you on fb! I follow you on twitter and tweeted! Mandatory Entry: I followed Hoover on Twitter AND I “like” “Deal”ectible Mommies on Facebook. Bonus Entry: I subscribe to your emails. Bonus Entry: I follow you with GFC. I follow Hoover on Twitter and I like you on Facebook. I “Like” “Deal”ectible Mommies on FB and I follow HooverClean on Twitter as suebaby05. Boy do I need this-Thanks for the chance! Following Hoover on Twitter now & already liked you on FB. I follow Hoover on Twitter and You on Facebook! I subscribed to your emails as well. I sub scribe to your email. Did the two part main entry. won´s last blog post ..Almost Review Time! Subscribe to feed via RSS. I follow Hoover on Twitter @mgoss123 and I like you on Facebook. I follow Hoover on twitter and you on FB. I put your button up. Follow Hoover on twitter and like u on facebook! I’m following Hoover on twitter and I Like “Deal”ectible Mommies on Facebook. I”m following via Google Friend Connect. brandy nelson´s last blog post ..Xander Eric Has Arrived!! I love Hoover. The first vacuum I ever bought was a Hoover, but, it is now 30 years old and I’m ready for a new one. Thanks for the chance. 1. Followed Hoover & liked FB page! Follow you on Twitter and Retweeted giveaway. I follow Hoover on twitter and like you on facebook. 1. I grabbed your giveaway button. 2. I grabbed your giveaway button. Your giveaway button is on my website sidebar. Subscribed to your blog by e-mail. I follow Hoover on twitter @DiamondStar728 and I like you on Facebook. Now following hoover on twitter (@sarahmama) and already a follower of yours on facebook! Sarah C.´s last blog post ..Holiday shopping for therapeutic toys! I like you on Facebook. Cindy D.
follow on twitter and tweeted. I’m a fb fan of yours and follow you and hoover on twitter @bouz76 I just tweeted your message! Ok, I am SUPER jealous! I need to send an email to my Hoover contact and find out why I didn’t get one to review. LOL! I want to win this! Follow Hoover on Twitter and Like you on facebook. Kelli @ 3 Boys and a Dog´s last blog post ..I want you to meet Five Fabulous Bloggers! I follow Hoover on twitter @nadicherie and I like you on facebook. following (@solstar) and liked for mandatory entry! Like you and follow hoover! Oh my, this would make my carpet spotless! Thank you so much for the chance! I follow Hoover on twitter (@whitechocolatec) and I like you on FB (username: Les Cerises). I’m a public blog follower via GFC. I follow Hoover on Twitter/flipper211 and I liked you on Facebook/Debbie Welchert. I follow you via Google Friend. Following hoover on twitter and like dealectible mommies on facebook!!! Hi Candace. What a fabulous giveaway! Thanks for hosting. I’m following Hoover on Twitter as tracysuz and I like Dealectible Mommies on Facebook too. Just added your cute button to my sidebar. I just subscribed to receive your emails. I’m following you on GFC as tonasun. Im a fan of hoover on twitter! I like dealectible mommies on facebook! I follow you with google friend contact! I follow you on Twitter as 2Cats2See and I tweeted. GFC Follower of yours @Alisha L.
I just followed Hoover on Twitter with this handle: @MeganDunham and liked you on Facebook as Megan King Dunham! I already follow you on Twitter and I just tweeted the giveaway! Ooo, just realized that posting that button was worth TWO entries, so here’s my second! I’m following you via Google Friend Connect! I follow Hoover and Like you on FB! follow on twitter and tweeted about giveaway!! tammy´s last blog post ..Swag Code!! I like you on FB and am following Hoover on twitter. I follow on twitter, I am a fan on Fb and I tweeted and I am already subscribed to your newletter!!! Love your giveaways!!! Sorry didnt notice the leave a comment for each one, so I will leave my first comment as I follow….. I am a fan on Facebook!!! I subscribe to your newsletter!!! Hoover on Twitter & “Deal”ectible Mommies on facebook. I follow Hoover on twitter, harvester and like you on facebook. I completed both steps to gain my main entry. Thanks for the entry. Bonus entry. I am a email subscriber. won´s last blog post ..Dont Miss This! I followed Hoover on Twitter. I am @StacieinAtlanta on Twitter. I already “Like”ed you on Facebook. I am Stacie Connerty. I am following you on Google Friend Connect. I am Stacie Haight Connerty on GFC. I follow Hoover on Twitter @FlipFlopReviews and I like you on FB. I have been talking about wanting to clean the carpets in our rental all winter. I don’t think they’ve probably ever been cleaned and I know it would be so much better if I could do it, but can’t afford a cleaning service and rentals are a little steep too. I would be sooo thrilled to get this!! Karen´s last blog post ..Welcome to our 2nd Edition of 3 Step Thursdays! Just signed up on Twitter to follow Hoover. Already “like” you guys on FB. Likes “Deal”ectible Mommies on Facebook/Debbie Rinaldi. I am an email subscriber ! I am a public gfc follower as Arianah_00. I’m a Google Friend Connect follower (as Amanda Davis) Thanks! I’m also subscribed via email. Thanks again! LOL after all is said and done I am a canadian resident and do not qualify.. Cest la vie lol. i followed hoover on twitter @pinkbeckie1988 AND like you on facebook! i am subscribed to your daily emails! I follow @HooverClean on Twitter! I ‘Liked’ Deal’ectible Mommies on Facebook! I follow your blog (publicly) via Google Friends Connect! I subscribe to your RSS Feed via email subscription! I follow you on Twitter and Tweeted this giveaway to All my Twitter Friends! Follow Hoover on Twitter (@hle123). Following you on Twitter (@hle123). I am following Hoover via Twitter as jlsc123. I follow Hoover on Twitter (mail4rosey) and I like you on Facebook (Sarah Smile). I follow you with GFC (mail4rosey). Great giveaway thank you so much! Liked on facebook. I said keeping fingers crossed and good luck all. and I like “Deal”ectible Mommies on Facebook. I follow “Deal”ectible Mommies on Facebook. I follow “Deal”ectible Moomies on Twitter (@mindiepack) and tweeted about the giveaway. I follow you on Facebook (Erin E) and I like Hoover on Twitter (@sewmuchstuff). Thank you for the lovely giveaway. I follow you via Google Friend Connect (Sewmuchstuff). I like on fb (name above) and follow on twitter! (soundofsilence7). Folliwing Hoover on Twitter and like Mommies on FB. I follow Hoover on Twitter and Like Dealectable Mommies on FB. #WIN a Hoover Platinum Collection Carpet Cleaner from @dealectiblemom (ARV $399) http://bit.ly/hsV102. I like you on facebook. stephanie a…. I follow Hoover on Twitter and I Like “Deal”ectible Mommies on Facebook. Following in twitter (leescrossroads) and already like you on fb!